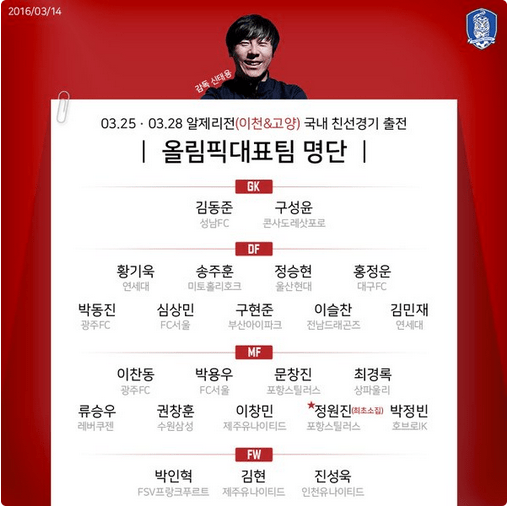 Uli Stielike and Shin Tae-yong have made their call ups for the March matches. The South Korea senior side will face Lebanon in a World Cup qualifying match (in Ansan) and then will face Thailand in a friendly match. The U23 team will play a pair of friendlies against Algeria. As one of the many Korean fans waiting for this lineup to be announced yesterday, I had some questions and wanted your input on this. Why do you think Stielike likes Lee Jung Hyeop? On his debut match against Sangju, to be honest, he was nowhere to be seen or hardly saw him make any impact moves. I mean Stielike selected him this time as a thanks for his performance in Asian Cup last year, but there a lot of doubts about him as a Striker. What do you think? 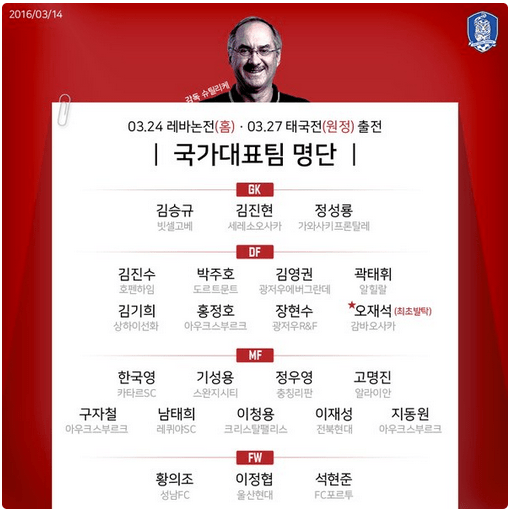 As I read comments on Naver’s news article regarding this, there are few consistent people who trashes Stielike because of his lack of solid performance as a coach, but he’s certainly doing well for now? I have to reserve my full opinion about him until we have our matches with Spain and Czech this June. Sorry for a lot of questions and rambling, but I just wanted to get your opinion on this. Thanks. Hey labrz – I think it’s your first comment on the Tavern? Welcome! I think there are a few factors. Firstly, Lee Junghyeob does have good work rate, it’s been said about him in the past and it remains. He’s also still fairly young (24-ish if I remember correctly?) so Stielike might see him as one for the future. This guy helped from that golden generation of German players that won the World Cup in 2014. Maybe Stielike feels like he can mold him into a mostly-target man who’s strong on the ball but isn’t totally inept when it comes to running (enter Kim Shin-wook). That being said he was poor against Sangju, like you said (though Ulsan as a whole were awful). I don’t really have a problem with his call-up here – it’s a meaningless World Cup qualifier and an even more meaningless friendly. But it’s true that Stielike has to be careful selecting him over players who’ve earned it (Joo Minkyu last summer). As for Stielike’s managerial performance itself, I think fans have every reason to be content. To be fair, every one of the WCQ’s so far were relatively solid wins – winning away in Kuwait and Lebanon isn’t really that easy. Our defense hasn’t messed up so far – which is a positive sign – though I do worry about the next phase of WCQ’s and the June friendlies. Some teams might stack up in numbers against us in the next phase (far more effectively than Laos and Myanmar) while Czech/Spain should be a very good test for our defense and Stielike – the only “tactical variation” we’ve really seen from him from the 4-2-3-1 system is the 4-1-4-1 – that slight shift against minnows. If we leave those friendlies with a good defensive performance and can counter attack properly, I’ll be satisfied. Especially since Ki will miss them, and we all know how important he is to the team. Skinny: Lee Junghyeob call-up – there isn’t a better time to call him up & Stielike – reserve judgement until June and onwards, but so far, so good (which hasn’t been the case for other managers). Thanks for your reply. I’ve visited your website before and left a comment under different name. I appreciate these posts you write about for the fans who may not be aware of how Korea Republic’s squad is doing! Anyways, Yes LJH works hard and tries to put his effort which is a good sign. I just hope he doesn’t make one of those screw-up shots like the one from our first match against Oman during 2015 Asian Cup lol. I just hope that Stielike continue to do well consistently on forward even though he has for the last year and a half. I’m glad he is doing well which wasn’t the case for the Korean team in the last 4 years. I can’t wait to see the match-up against Spain and Czech!